Humm-Bug Hummingbird Insect Feeder. Bugs Are So Attractive! Would you like hummingbirds to nest in your yard! The Humm-Bug Hummingbird Insect Feeeder is a Unique, First of It's Kind Hummingbird Protein Feeder. Protein from insects is actually the main food to sustain life for a hummingbird. A mother hummingbird needs to supply protein to her chicks constantly throughout the day. By supplying a source of protein you just may have the pleasure of her taking up residence nearby to nest. Hummingbirds cannot survive on nectar alone. Protein found in insects are necessary for their survival. Hummingbirds consume 100's of insects a day and fruit flies are among their favorites. Hummingbirds feed their chicks protein every 20 minutes. 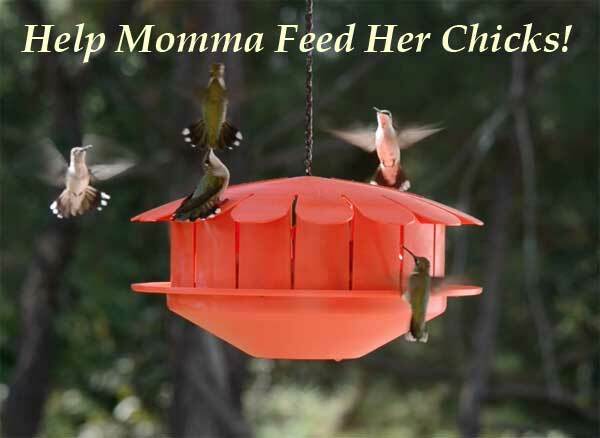 Hang the Humm-Bug feeder in a dry, shaded area. Near nectar rich flowers or nectar hummingbird feeders. Lift the lid of the Humm-Bug feeder and fill the feeder with banana peels to incubate and produce fruit flies in the feeder. Empty, Rinse and Refill every 3 weeks. NOTE FROM THE MANUFACTURER: "Keep in mind, the Humm-Bug works best later in the season. July & August tend to be warmer months which in turn cultivates more fruit flies!" Hummingbird chicks are usually born during these months when the protein from fruit flies is most needed. The Humm-Bug should work earlier in the season for those of you in Southern areas. Includes a 12 inch cable hanging loop. Made of solid red plastic with drainage. Spacious protein feeder with 15 Ports. Dimensions: 10"L X 10"W X 5 1/2H"